Yo, Congress, Keep On Truckin' -- Can you dig it? Those who draft laws and regulations must do so with sufficient clarity so as to convey what conduct is proscribed or prohibited -- failing to discharge that obligation creates speed-traps that catch the unwary and burden our judicial system. Under the guise of reform, Congress recently churned out a flurry of laws for the financial services industry (and various governmental agencies are charged with further rulemaking). It is imperative that the new rules of the road are concise. A Stop sign must look like one. The speed limits must be clearly posted. Enforcement must be vigilant and even-handed. Justice must be swift. The byproduct of lawmaking is rarely pristine. Too often, our legislators burden a proposed law with so many amendments and special-interest provisions that a once clear-cut draft is rendered unintelligible. As a result, the press becomes filled with stories about jury verdicts being set aside on appeal because the underlying laws are "void for vagueness" or because they failed to give adequate notice. All of which regularly leads to one verdict at trial and a different one on appeal -- this up-and-down, twist-and-turn nature of criminal and regulatory enforcement drives all of us who participate in the process crazy. Public Accounting Oversight Board: http://www.brokeandbroker.com/index.php?a=blog&id=464 . Defendants often complain that they had no idea that the acts they are accused of engaging in constituted proscribed or prohibited conduct. They point to the language of whatever law or regulation that they are charged with violating and argue that it doesn't say what their adversary suggests, or that it says what it says but it means something different. Similarly, prosecutors and regulators sometimes have a penchant for stretching the laws and regulations that they enforce to cover a whole host of sins. In some cases, one would think that the statute or regulation was made of rubber. All of which makes it critical that the laws, rules, and regulations of Wall Street be promulgated in an intelligible manner that clearly sets forth what is allowed and what is prohibited. What a provision was meant to say should be what it says -- there shouldn't be any guessing or uncertainty. Unfortunately, so much of what has been proposed as financial regulatory reform, and so much of what will likely emanate from the various agencies and commissions that will soon embark upon rulemaking, is vague. If there is one thing that courts will not tolerate it is vagueness. The law books are filled with agreements, contracts, rules, regulations, and laws that have been struck down as void for vagueness. I fear that much of FINREG may be headed for the same garbage can. When I try to explain the concept of void for vagueness, I typically have to resort to all sorts of examples -- many involving legal arcana and others which don't quite make the point. However, the other day I was presented with a wonderful illustration of this legal puzzle while visiting the Bronx Zoo in New York City. Okay, so, go ahead, tell me, according to the sign, what exactly is prohibited? As best I can tell, you can't do something with some kind of footwear that has a wavy sole. As you can tell from the background image, there isn't any grass around, so I'm not particularly sure what the green tufty stuff at the bottom of the image is, but let's assume that it's either natural or maybe artifical grass. There is no human leg in the sneaker, so perhaps you're not allowed to throw a shoe -- a la the protest launched at former President Bush in Baghdad? Perhaps if the Iraqi authorities had prominently posted this sign on the doors leading into the press room, that dissident reporter would not have been arrested and jailed? On the other hand, there seems to be some prominent issue about wavy treads on the bottom of the shoe and I don't see any shoelaces, so maybe the sign is warning us against wearing loafers or slip-ons at the zoo? Of course, since this is a sign at the zoo, maybe the wavy lines aren't part of the shoe but are a failed attempt to depict animal feces and we're supposedly being told not to wipe our shoes off on the non-existent grass? Then there's the existential issue that no human leg is drawn in the shoe. Perhaps this sign is not about wearing shoes and doing something while they are on. Maybe this is a warning against self-levitating shoes? Or maybe there's some popular child's game of shoe skipping in which you sidearm a shoe across the grass in the fashion of a shell or pebble at the beach -- and the kiddies are being warned that such activity is not allowed at the zoo? Of course, the upper-right part of the sign really puzzles me. What the hell is &dollar;6? 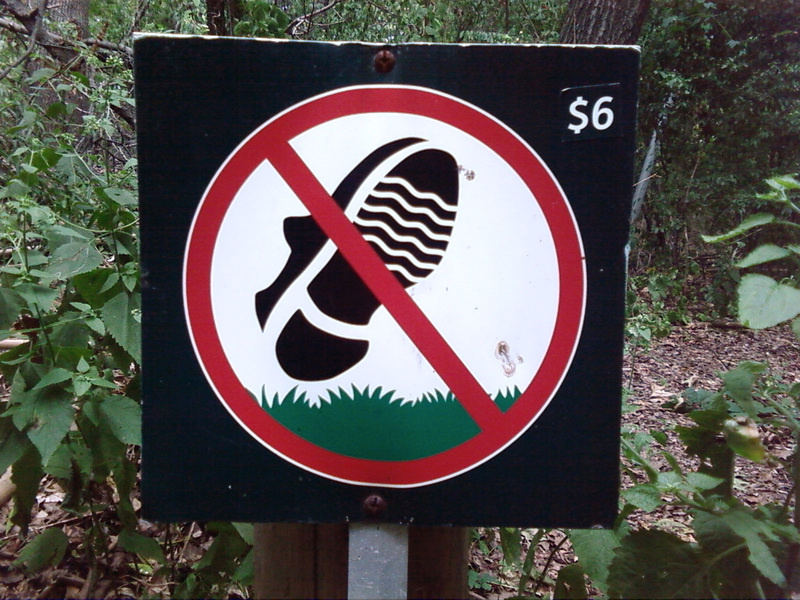 Maybe the &dollar;6 is the cost of playing shoe skipping along the grass or the charge for self-levitating loafers at the zoo? The &dollar;6 could be a fine but nothing indicates that on the sign and, anyway, have you ever heard of any fine being a measly &dollar;6? Not that I'm so eager to show my age and all, but, come to think of it, way back in the '60s, comic artist Robert Crumb had this image of four guys who were truckin'. What's truckin' you ask? Oh my, how do I explain that word. . . hmm. You know it's sorta from that period when we rapped with each other and talked about the man and things were cool and groovy and, can you dig it, but, like, y'know, wow, it was far out. In any event, to the extent that I actually remember the '60s, I do recall that there were these shoes in the iconic Crumb image that look a bit like the shoe on the zoo sign. So, maybe the zoo sign means that you can't "Keep on Truckin'" and, if you do, it's gonna cost you &dollar;6? In any event, Congress does seem to keep on truckin' with its wayward ways, no matter what, and the same could be said for all the various regulators of Wall Street. I'm sure that we will soon be overwhelmed with a ton of indecipherable laws and regulations that will clog the courts with hotly contested cases and subsequently jam the appellate pipeline for years to come. So much for progress. Hey, Congress, you know what I'm saying? Can you dig it? Keep on truckin' dudes. It's all cool and groovy here. Whoa, far out. Peace. If any of you have an original take or insight as to the Bronx Zoo sign, please write to me (anonymously or otherwise) and I'll be happy to post the notable comments. In any event, boys and girls, that concludes are lessons on the constitutional issue of a law being void for vagueness. Closed book test on Friday. Rodman & Renshaw and other Claimants filed a FINRA Arbitration Statement of Claim (initially in October 2006 and thereafter as amended) against Respondent Matthew N. Murray. Among other claims, Claimants alleged defamation, tortious interference with business relations, breach of fiduciary duty, conversion, breach of contract, and prima facie tort, trademark infringement, and cybersquatting. In the Matter of the Arbitration Between Rodman & Renshaw, LLC, John Borer, Edward Rubin, Michael Vasinkevich, and Wesley K. Clark, Claimants, vs. Matthew N. Murray, Respondent (FINRA Arbitration 06-04643, August 26, 2010). The FINRA Arbitrators found Respondent Murray liable for and ordered him to pay to Rodman & Renshaw, LLC, compensatory damages in the amount of &dollar;10,700,000.00 plus interest at 9% per annum from August 9, 2006 until August 12, 2010. Respondent's Counterclaim request for expungement were denied. Yo Congress, Keep on Truckin' -- Can You Dig It?